This small scale peanut oil pressing line is fully adopted mechanical driven, it connects each oil processing machinery together to extract oil with higher oil yield and at the same time, change the single machines by manual into the semi continuous production line to liberate the workforce. It is really an ideal investing item with little investment, high production efficiency and high profits! Oil mill equipment in the pressing line changes according to raw materials and production. Above is the design plan for 5TPD peanut oil pressing line, just for reference only. You can also use an automatic oil press machine instead of the screw oil press and oil filter press for our new automatic oil making machine is a integrated oil expeller with vaccum filters. If you're trying to eat a healthier diet, you may want to take a closer look at the oils you cook with. Peanut oil has a high smoke point so it can be used for high temperature cooking. In addition, it has a pleasing taste that can add additional character to a dish. What are the benefits of peanut oil? Is it a healthy option for cooking? 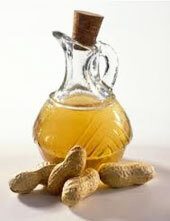 Peanut oil provides several health benefits and offers a healthier source of fat. Additionally, peanut oil often costs less than olive oil, although it contains most of the same nutrients and provides many of the same benefits; hence, it makes a wise economic choice as well as a flavorful, healthy food choice. When buying peanut oil, look for packages that state "100 percent peanut oil," to get the most benefits. Lower cholesterol, Lower blood pressure, Aid weight loss, Benefit diabetics.